Neo Technology, creators of Neo4j, the world’s leading graph database, today announced it is hosting a series of Neo4j meetups, workshops, and hackathons in lead-up to GraphConnect 2012, the first conference to focus on the rapidly growing world of graph databases and their applications making sense of connected data. The Neo4j events, scheduled from September 24 – 29, in several venues across San Francisco, CA, will host over 800 attendees with many more expected to join. While the Trulia event is now sold out at 300 attendees, with 40 holding on the wait list, Heroku Hack Night has 13 available spots available for a four hour hack shop in SOMA. All events will be open to engineers and graphistas from every skill level and will include refreshments and a few hours of coding led by experienced Neo4j developers. Prizes will include tickets to this year’s GraphConnect 2012 to be held in San Francisco from November 5 – 6. 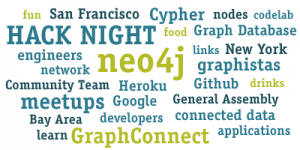 Neo4j event partners include Trulia, Heroku, Github, and the Google community. Join graph database expert Max de Marzi for an East vs. West hacker ‘throw down.’ As a giant developer playground for collaborative coding, github represents a few fascinating data sets: a social graph of people and their skills, a project graph of branches and forks, and a dependency graph of projects. We’ll explore this coding landscape by diving into these graphs with different technologies, approaches, frontends and approaches. Join a member of the Neo team to represent the East Coast in our East vs. West hacker ‘throw down.’ As in the Graphhub – West event, Github will offer ten random NYC attendees a year of its Micro plan! Promo codes can be redeemed up to ten times each, and will expire Jan 31st, 2013.